It’s been a while since I last posted something on this blog; over a month, in fact, and I can see the viewership statistics on my dashboard steadily dropping. Well I’m back to the days of school again, and I don’t have much free time to think of ideas and spend hours doing 4komas, not to mention build any gunpla. Sorry about that. If you’re expecting toy reviews, I kinda hope I can dig up some free time for when I lay my hands on some stuff, and with the crazy amount of preorders I’ve gotten myself into, I’m pretty broke now. 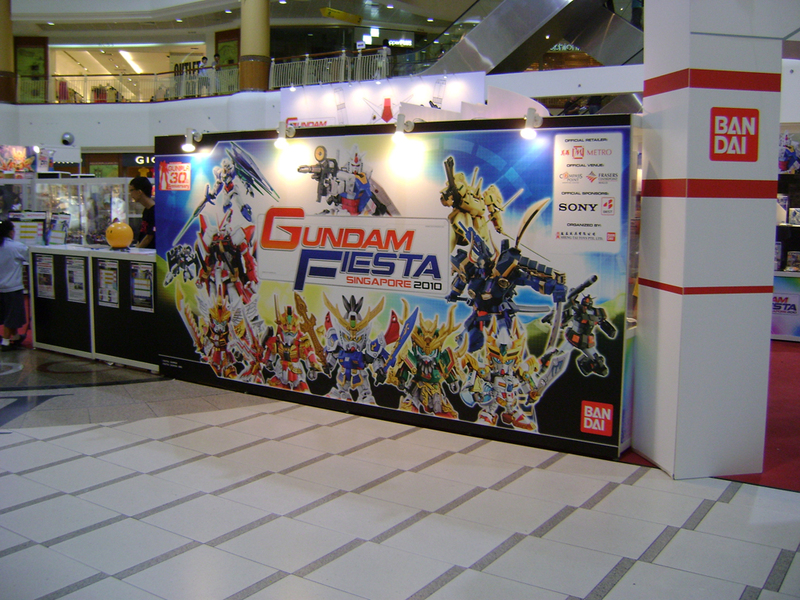 This event is currently held in Singapore from 2 – 14 September. I thought I would be missing out on it since school took up all my free time. Today I had a pretty useless make-up lecture in the afternoon and decided to just go take a peek there when it ended. I didn’t expect to get anything since I’m now a student and not paying taxes to the government, and most of the event-limited stuff would probably be sold out long ago. Indeed, I left without buying anything. Tons of people were snapping up the limited edition kits and the MG Sinanju. I wish I had some dough. I have actually completed my 1/100 Tallgeese after 7 months of procrastination! However as I achieved that just a moment ago I haven’t had time to take pictures of it, though it won’t look very different from the ones I took last time. The only work done on it since the last update is the pathetic attempt at doing the panel lines and a go at spraying flat all over the model. The results are much better than my previous attempts which always resulted in the model turning white. I guess the key to making it look alright is to go over it very fast and briefly. While spraying gloss requires the part to be wet, this does not apply when doing flat. Instead the part should just begin to show the flatness right away. If it looks wet, the coat is too thick and will almost certainly result in whiting. 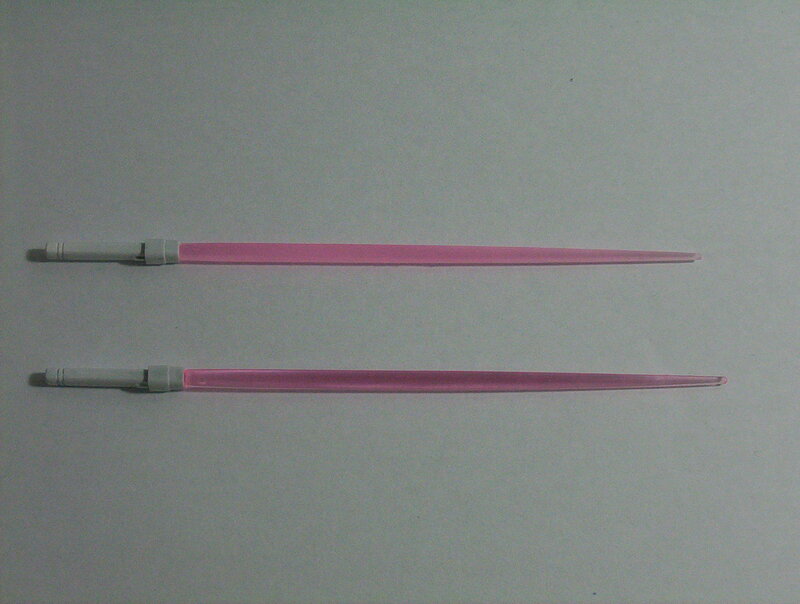 Additionally, I gave the beam saber clear parts a coat of flat and the results were rather interesting to me. It’s almost like the airbrushed translucent blades the professionals do. Here’s a quick photo to show the result. The top blade is sprayed with flat while the bottom one is the stock unpainted version. I believe there are some people who prefer the blades to be clear instead of being translucent or almost opaque. I think it gives the blade a glowing appearance. This may be the last time I’m taking photos using my old 2 megapixel camera. When my parents purchased the split air-con, there was an offer where we could buy a “Sony 7 Pixel Digital Camera” at $5 SGD. My brother made them fall for it in the name of sharing it with me (he already has a Sony Ericsson 5 MP Cyber-shot phone, probably a C902, not sure of the exact number). It turns out to be a Cyber-shot S750. Perhaps I’ll take a picture of it using the old camera as its final picture. I’m not sure what the difference will be though, apart from having to deal with obscenely huge images. 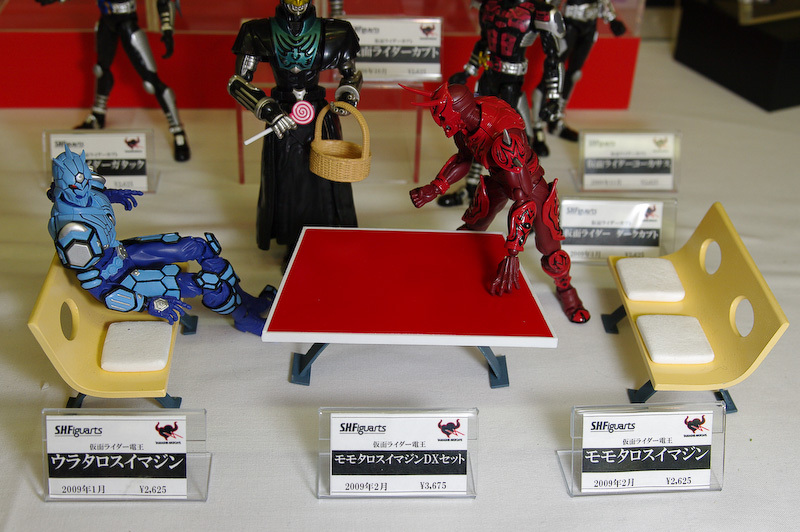 In other news, Akibahobby has photos of the upcoming SHF Momotaros Imagin DX Set as well as upcoming SHF Kabuto series Masked Riders from the Miyazawa Model Show 2008 (beware questionable content ie. lots of questionable female figurines). The absurd design of Masked Rider Decade has been confirmed in this magazine scan I stunned from SGCollect. Lastly on a model-related note here are a few prototype pictures of the GFF Metal Composite Zeta Plus. I believe it’s 1/100 scale and will cost a bomb as with all the other figures from the GFF line. However the Zeta Plus Hummingbird is just too cool to ignore, especially in its Wave Rider mode. It’s simply bursting with Katoki-ness and would look totally at home in a scrolling shootemup. If there were an MG model of it, I would snap it up right away.